This special NEXUS issue seeks to uncover Asian American experiences in global cities by engaging in a comparative study of Los Angeles and New York. The demographic facts are astonishing – over a quarter of the 15.7 million Asian Americans reside in either of the two greater metropolitan regions, where they comprise over a tenth of the total population in each metropolis. Drawn by potential opportunities, Asian Americans are integral to these global cities, contributing to the rich cultural, economic, social, and political landscape and serving as links to their home countries. Within each region, Asian Americans have established vibrant urban neighborhoods and ethno-burbs that serve as a foundation for newer immigrant groups to pursue upward mobility for their families and future generations; mobilize to build a political voice; and create unique identities. Asian-specific place-based social, political, and economic institutions and practices that sustain and build community. What distinguishes Asian places and neighborhoods in Los Angeles and New York? Are there internal and external structures and dynamics that transcend location? How do similarities and differences in community formations relate to the Asian diaspora and racial/ethnic group dynamics? Cultural productions and collective actions as a means to inform, mobilize, and build community and/or expose socioeconomic inequities for efforts to achieve parity. How are Asian Americans working to build broader multi-racial coalitions? How does global economic restructuring influence Asian American neighborhoods? The publication will also contribute to Asian American Studies vis-a-vis theorizations of global cities and engaged practices. We encourage paper submissions that provide perspectives of practitioners, academic researchers, and applied policy analysts. To facilitate an active dialogue and exchange, we encourage co-authored papers ideally from LA and NY based authors, but will also accept single authored papers that focus on one or both regions. http://www.aasc.ucla.edu/aascpress/pressresources.asp and click on STYLE SHEET for Article Submissions (PDF Document). AAPI Nexus is a peer-reviewed, national journal published by UCLA’s Asian American Studies Center focusing on policies, practices and community research to benefit the nation’s burgeoning Asian American and Pacific Islander communities. The journal’s mission is to facilitate an exchange of ideas and research findings that strengthens the efforts through policy and practice to tackle the pressing societal problems facing Asian American and Pacific Islander (AAPI) communities. Since the inception of ethnic studies, the goal of “serving the community” has been at the heart of Asian American Studies and Pacific Islander Studies. Deadline for Letter of Intent for LA-NY issue: December 15, 2010. Deadline for Manuscript Submissions for LA-NY issue: February 28, 2011. I wanted to make sure you were aware of this unique opportunity at the Wabash Center. Please forward this announcement to Asian and Asian North American pre-tenure colleagues. The Society of Biblical Literature holds an annual convention for professors of Bible and graduate students in Scripture. At the recent meeting in Atlanta, GA (November 20-23) ISAAC scheduled an Additional Meeting to preview SANACS Journal issue #3 and to introduce some of our other publications. ISAAC was represented by Dr. Andrew Lee, East Region Director, and by Dr. Russell Moy, Board chair. An abstract from Dr. Uriah Kim’s essay, “Reading David from Asian American Context,” was shared as Dr. Kim was unable to attend SBL this year. His thesis is that David was able to cross boundaries and forge alliances in part due to his own biracial background. Kim then offers insights into boundaries and the possibilities of Asian American hybridity. Dr. Bo Lim, who teaches Old Testament at Seattle Pacific University, introduced his essay on “In Search of a Narrative: The (Post-)Exile for Asian American Biblical Interpretation and Theology.” He proposed the themes of exile and diaspora to organize an Asian American narrative. Using an expanded concept of exile, Lim analyzed passages from Isaiah and Ezra-Nehemiah and applied them to the experience of the Korean American church. Dr. Chloe Sun (Logos Evangelical Seminary) briefly introduced Mirrored Reflections: Reframing Biblical Characters, which she co-edited with Dr. Young Lee Hertig, director of ISAAC Southern CA. The stories of women in the Bible are intertwined with personal anecdotes from the lives of the Asian American women writers. Chloe had the opportunity to sign the books that were purchased by the attendees. New friendships were made through the meeting with guests coming from as far away as Hawaii and as close as Atlanta. For at least one person, it was his first encounter with Asian American issues in an academic setting and he quickly procured all the items on the book table so that he could continue reading in this field. SANACS 2010.1 Journal now available! The Society of Asian North American Christian Studies Journal #2 (a jury reviewed academic journal). This issue contains papers presented at the ISAAC Southern California “Asian American Equipping Symposium” held at Fuller Theological Seminary (Pasadena, CA) Nov. 2-3, 2009. Non-members may order a hard copy or digital download of the latest SANACS Journal at the ISAAC website Publications link. SANACS invites submissions for the next journal under the theme of “Asian American Biblical Interpretation.” In addition to professional Biblical scholars, those working in other fields are encouraged to submit papers on this topic. Given the focus of this journal, papers ought to demonstrate relevance to Asian North American Christianity. The due date for submissions is Sept 1, 2010. All articles should follow the SANACS Manuscript Submission Guidelines with the following change: rather than sending your paper to Russell Yee, email submissions to Bo Lim at the information below. 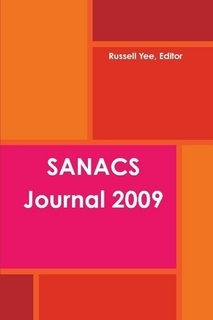 2009 SANACS Journal now available! Discounted additional and bulk copies may also be ordered on-line.